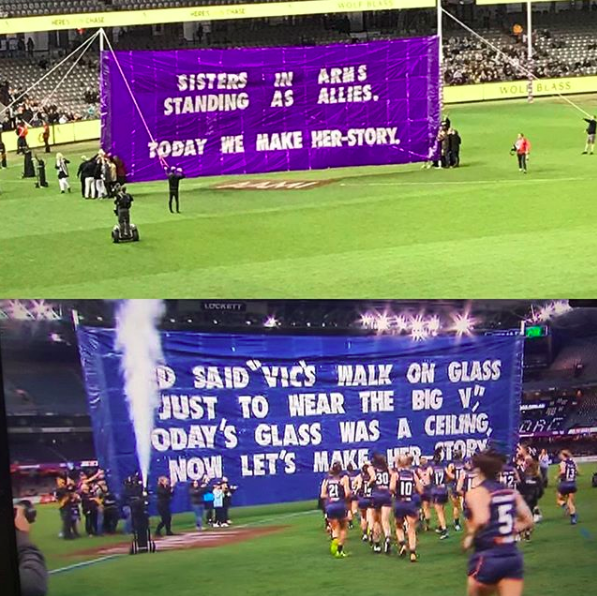 The first banner I wrote was for the historical AFLW season opener at Princes Park in 2017 and will forever remain special. I love this photo. The weather almost destroyed this one. My first banner for the AFL side and possibly the most infamous banner of the modern era. 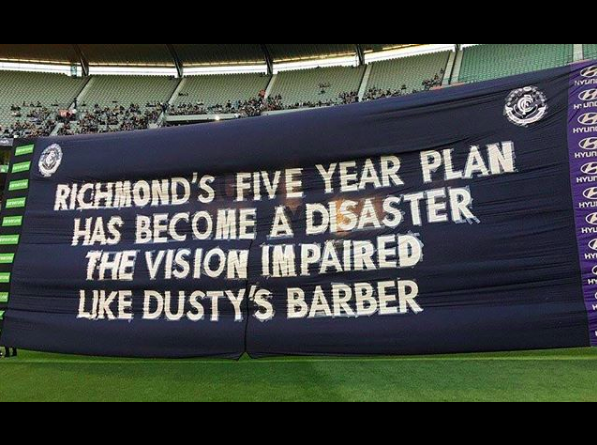 The banner that won Richmond a flag and Dusty a Brownlow (and almost sunk my banner writing career before it even really started). Fans found it hilarious, but many humourless media types like Damien Barrett and Craig Hutchison called for my 'sacking'. It's a big piece of crete paper guys. Relax. A number of 'sports journalists' did some half-assed research on who wrote it, as a made up story soon circled that 'the club had hired and paid a PR Firm to write the banners'. Such is the state of modern journalism. Regardless, it's still pretty funny. Breaking chronological order here to post the follow up banner vs. Richmond in 2018. Proof that you can always diffuse a situation with a good dose of self-awareness and humour. 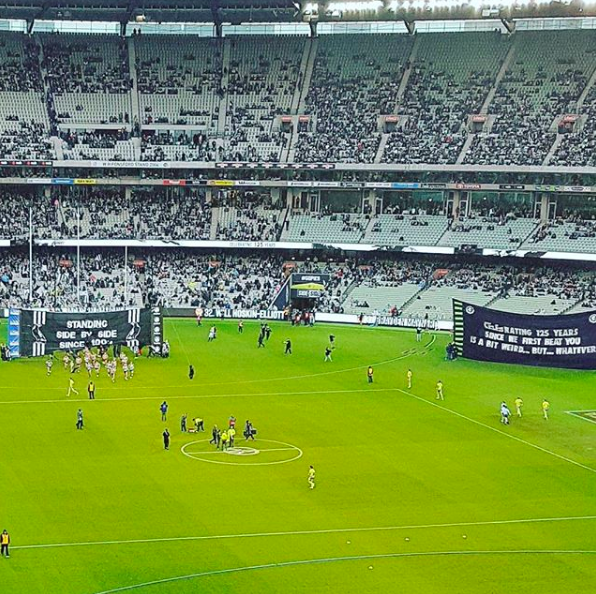 Even better, we won on the day and Eddie McGuire had a massive sook about the banner. Delicioso. This banner combo made Danny McGinlay's best banners of 2017 segment during the AFL Grand Final telecast. 'Riling up the locals' became a constant aim and this one definitely met the brief. This game was played in WA. Writing gags is fun, but these moments are something else. For the 2017 Indigenous Round we reached out to North Melbourne to create a joint banner that all the players would run through together. Thankfully, they accepted. The second time we played Richmond in 2017 I wasn't allowed to say anything due to 'Dusty-gate', but we had just won our fourth Rising Star Award for the year so this was a nice way to recognise it. I've never had a pie floater but, despite how horrific they sound, have heard they go alright. Melbourne fans were starting to talk finals, so this was a bit of fun. 'Hey Dees Fans' ruins the cadence, but someone at the club apparently thought we needed it so 'everyone would know who we were talking about'... go figure. Danny McGinaly and I were preparing for a 'banner battle' before the Carlton-Bulldogs game, but it then fell on Carlton Respects round. 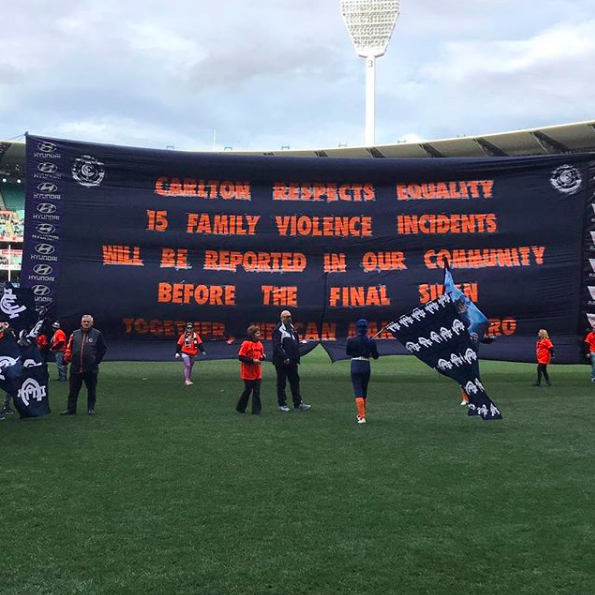 Carlton Respects is an initiative aimed at raising awareness around Australia's domestic violence problem. Instead of fighting, we worked together. Based on statistics, I put this banner together, and Danny's banner told everyone to look at our banner instead as it was more important. The bottom line reads 'TOGETHER WE CAN MAKE IT ZERO'. Nice, simple but important message for our Multicultural Round game against the Cats. This one was very cool to be involved with. I loved State of Origin as a kid, and was asked to put together the banners for the 2017 AFLW State of Origin match between the Allies and the Big V. The Vic's side starts with 'TED SAID', referencing the late great Ted Whitten. No gags or puns here, just a reminder of how triumphant the 2017 AFLW Season Opener was for both the game itself and the Carlton Football Club. This one was an absolute ripper but the wind literally ripped it to shreds before anyone took a photo. Tayla Harris has a penchant for taking high-flying hangers on a regular basis. 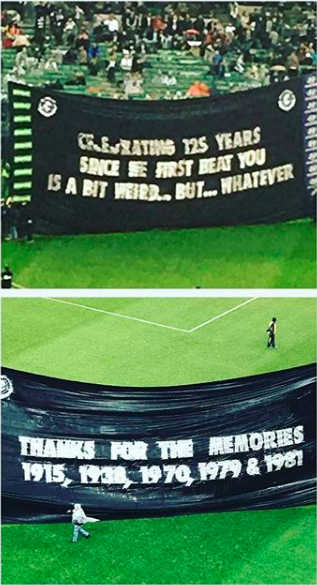 What do you do when Eddie McGuire complains about your funny banner? You make another one next time. Due to our poor on-field performance in 2018 I was pretty much barred from saying anything about the game/team/performance and banned from making any jokes. I still snuck some good ones in though. This game was against Adelaide, at Adelaide Oval, and I called the ground 'The Portress'. 'The Portress' is what Port Adelaide call Adelaide Oval. This one went viral on social media, made the papers in Adelaide and had Port fans in stitches. No one got a photo of one of my only funny banners of 2018 so you'll just need to use your imagination. The story here is that we played Geelong, in Geelong, for the first time since 1997. FROM THE BLUES OR SUNS GANG? 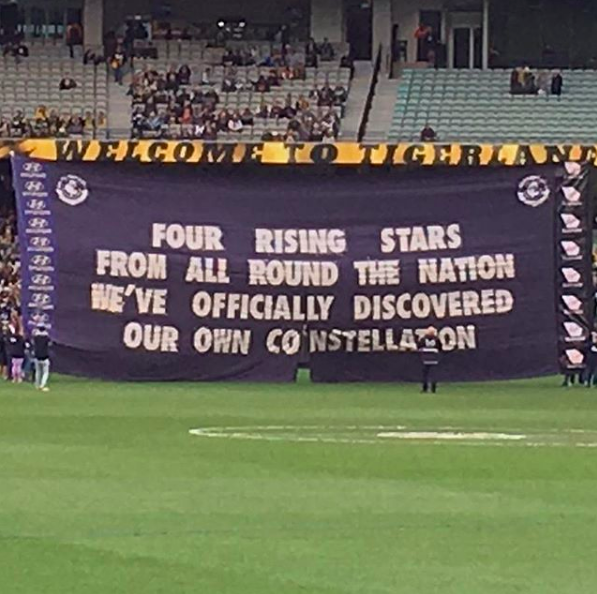 This was called 'one of the best banners ever' on the AFL subreddit. If you don't get it, ask one of your mates from Queensland, specifically the Gold Coast.